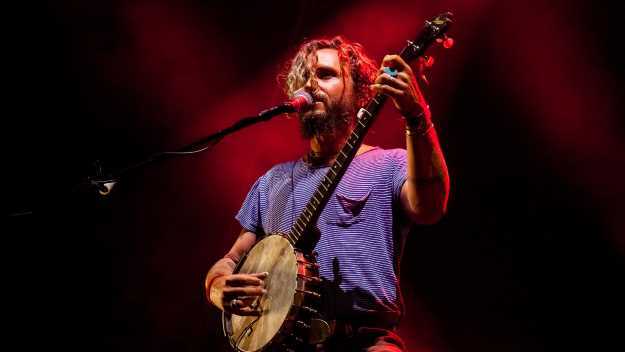 A couple of days ago Missy Higgins got a circle tattooed on a wrist by WA's favourite American-accented Aussie troubadour John Butler. Higgins told the audience at the first capital city stop of the pair's national tour on Friday night in Kings Park there had been a lot of serendipitous things happening to her lately. "We toured together some 14 years ago when I was a wee sapling and it was just me and my keyboard," she said. "Now we're back together and have really gone full circle." The songwriter was referring to a tour back in 2004 when both acts were blowing up. Higgins had already released her single The Special Two and came out that year with her debut album The Sound of White featuring the Aria-award winning track Scar. The John Butler Trio meanwhile worked their way into the greater Australian conscious with absolute ear worm Zebra. Back then a 21-year-old Higgins, who credits Butler with being one of the generous souls to give her a break in live music, only companion on the road was a keyboard. Now, she has her husband and two children and a five-piece touring band including jazz vocalist Elana Stone. Higgins had the crowd singing in chorus finishing with her aforementioned early singles as well as her sophomore effort Steer to finish her set. By the last song a cold seemed to be getting the better of her voice although the crowd paid it no mind. She subsequently pulled out of Saturday night's second Perth show citing a severe throat infection. The hits were not the highlights, however, as the songs which track Higgins journey into familism such as Arrows which she wrote for her husband and played at their wedding as well as Futon Couch and Song for Sammy - a ukulele lullaby for her first-born - glowed with the warmth of her contentment. For Butler too it was the more recent offerings from last year's album Home, which incorporates EDM drums and synth with his trademark sound, steeped in his family relationships, rather than the environmental and protest songs he has been known for, that shone through. The guitarist mused about how he wrote Just Call about meeting his wife in Broome and it was funny how Higgins had actually done the same thing - Futon Couch. It's hard to think the song Coffee, Methadone and Cigarettes - written about the death of his paternal grandfather fighting the Nannup fires on January 2, 1958 - would invoke the wave of empathy and understanding it did for the WA audience. Opening track Wade in the Water gave off some Pearl Jam and Allman Brothers vibes while Blame it on Me allowed Butler to unleash his inner-Hendrix with some screaming rocks solos on a Fender Telecaster as opposed to his trademark 12-strings. Butler classic Betterman felt a bit lacking in the raw energy department but the band - made up of drummer Grant "G-Money" Gertathy, soulful bassist Byron Luiters, keyboardist Ben Corbett and backing vocals and percussionist revelation Lozz Benson - more than made up for it with blistering renditions of Pickapart, Funky Tonight, Zebra and Don't Wanna See Your Face. Ocean is an ever present part of a Butler and continues to be his opus as he still puts all of his being and finger tapping skills into the song. One of the only disappointments of the night was not getting to see Butler and Higgins share the stage for any songs. It's not a stretch to think concert opener and Fremantle muso Stella Donnelly will be the one headlining a Kings Park show. The rising star would only have been 11 when Butler and Higgins toured all those years ago and said she was "bloody nervous" to play ahead of two legends. Donnelly's witty larkinism is always a delight meaning some of her songs can come at you strong such as the ever confronting breakthrough single Boys Will Be Boys. The stirring solo tracks, more befitting of the intimate night time gigs Donnelly fans are used to, were overshadowed in this instance by cruisy whole-band new tracks off her upcoming album Beware of the Dogs. Old Man and Tricks were summery standouts and the crowd was even treated to a cameo by Donnelly's 16-year-old brother Jack on the sleigh bells. "He's actually a great drummer," said Stella. "But you can't just f...ing get on the drums, you've got to start somewhere." Donnelly went right to the bottom of her range with a cover of Paul Kelly's Careless and probably should have finished the set on Tricks rather than do her abridged version of Mean To Me which she cut short about a minute in not realising how little time she had left on stage.